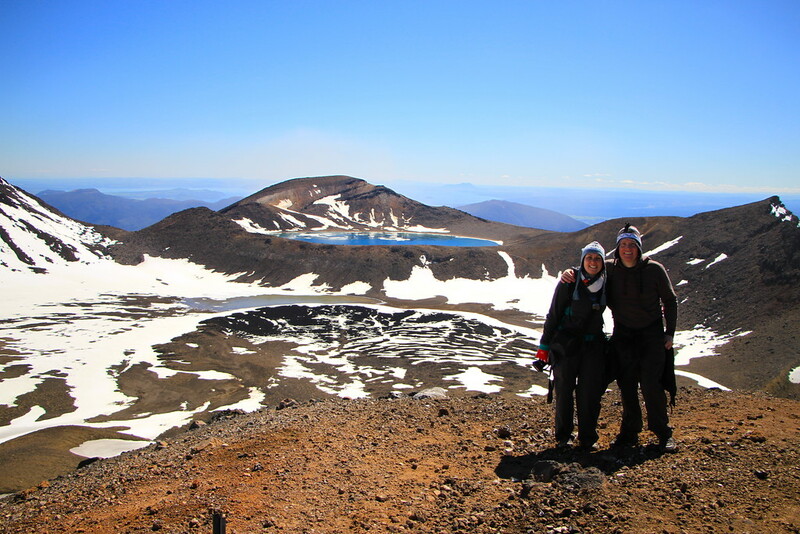 Incredible Volcano Hiking on the Tongariro Alpine Crossing! Chugging up the North Island of New Zealand in our little Geisha campervan, we were excited about what was to come. The previous two weeks had seen us drive around most of the South Island before taking a ferry across the Cook Strait to the North Island. We’d done a lot of sitting down, and sampled many of the delicacies of the Marlborough wine region so it was about time we did some exercise! 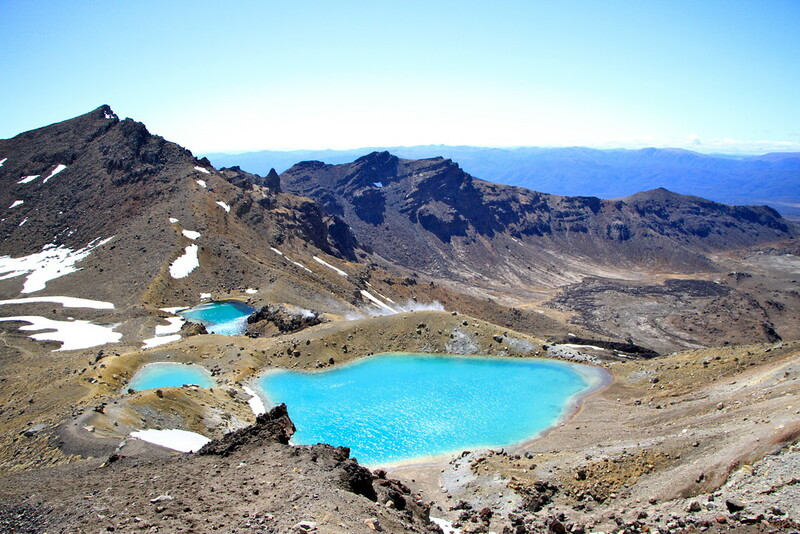 We’d heard about an amazing one day trek you could do in the Tongariro National Park, and decided to check it out for ourselves. 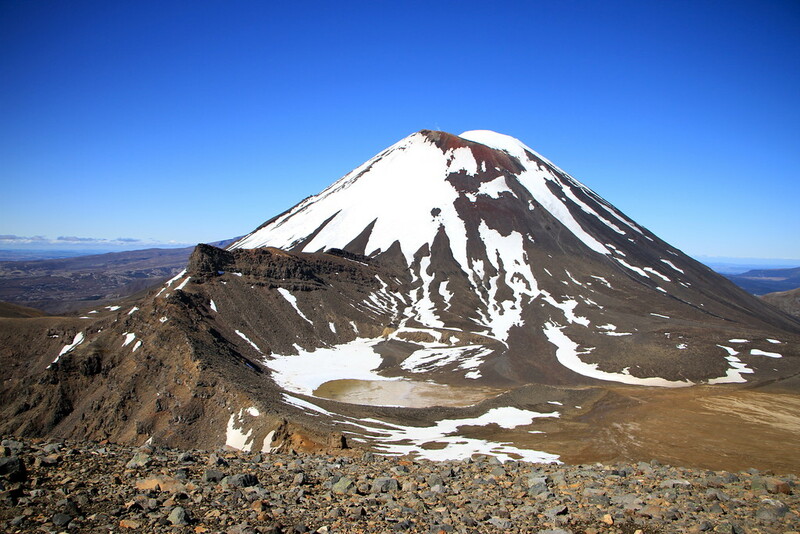 We checked in to the Discovery Lodge campsite close to the trek, and before we knew it we’d booked our early morning shuttle for the next day and began psyching ourselves up for the challenge of the Tongariro Alpine crossing. What followed was one of the best days of our travels to date, and makes it onto our rarely populated ‘must do’ list, alongside our incredible rinjani trekking adventure in Indonesia, and our Sapa trekking experience in Vietnam! With our eye watering 0545 departure time confirmed, we hit the sack early in the hope of catching some sleep before our big trek the following day. 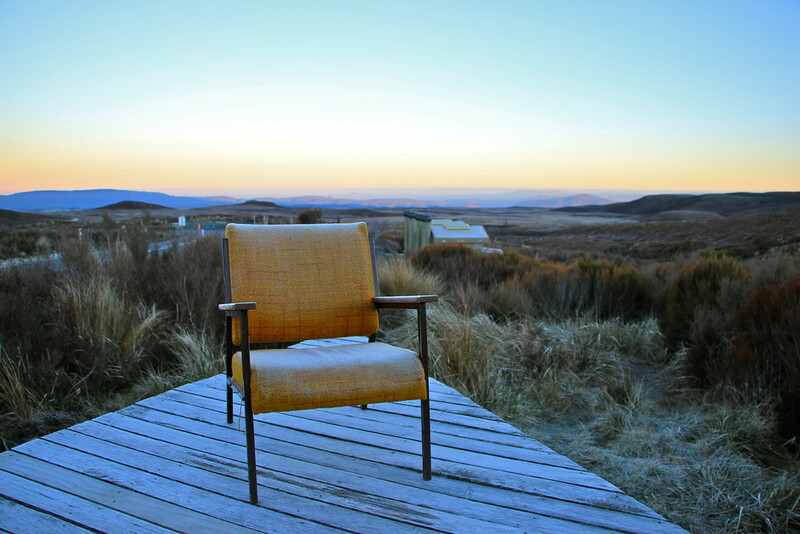 That plan was scuppered as temperatures dropped below freezing that night, and our campervan froze from the inside. We were rudely awoken at 1am by our own teeth chattering, and found ice across the inside of the windows. It made us wonder why we’d decided to spend a month living in a campervan. Our carefully prepared sandwiches were also frozen, well at least they wouldn’t go off during the night, and the wine would be nice and chilled. Morning came, and in the darkness (and bleary eyed) we layered up with our thermal under layer, trousers, long sleeve walking top, fleece and waterproof alongside our hats and gloves. A quick bowl of cornflakes with the coldest milk of all time, we were ready for action. The journey to the beginning of the crossing takes around 20 minutes, and as the sun began to rise around the mountains, we got an idea of what the weather, and views were likely to be like today. With luck we were told conditions were perfect for the trek, and that we should have unobstructed views all the way along the trek. Jackpot! After being dropped off at the beginning of the crossing, and getting over the peculiar furniture arrangements, we were ready to go. The first hour was easy and fun. We chatted as we walked, marvelled as the sun slowly rose over the peaks we were about to ascend. It was lovely. And then the first ascent came. Never before have we seen so many false summits, each time reaching the ‘top’ to be confronted by another 100 metres up. And again, and again. Cursing, we wondered why we were putting ourselves through this, we don’t even like walking really. In fact, we realised the last time we did a big walk was in 2010 when we trekked the Inca Trail to Machu Picchu. We’re not exactly outdoors types, and not exactly in peak physical condition as well. 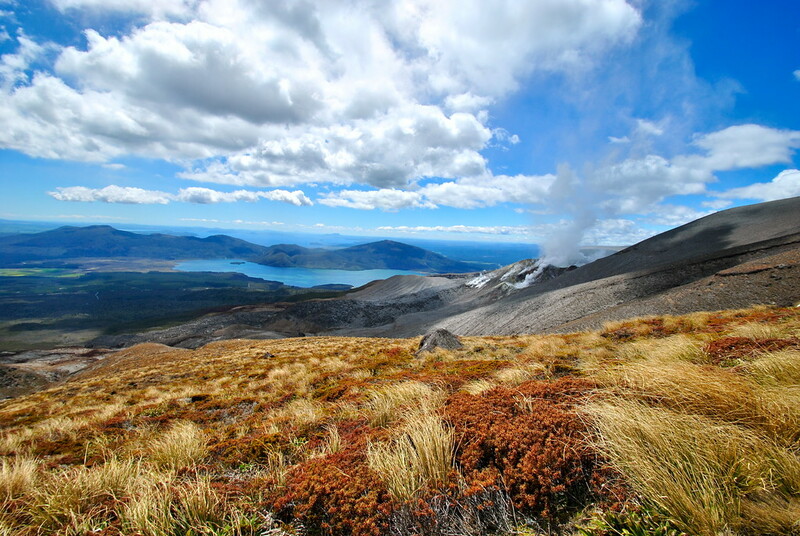 The weight of a few New Zealand white wines was weighing down on us as we climbed for an hour to the south crater. Pausing for breath, the wind wipped up again as we climbed to the second highest part of the trip, for incredible views of the crossing across the crater and the rolling hills and valleys in the distance. It was at this point that we thought we’d reached the top, had a little high five and looked forward to the descent. And then the couple who had been sitting at the top with us got up, and began climbing the peak to our left. Perhaps they fancy seeing the top before descending again? And then the realisation, we weren’t at the top, not by a long way. Crestfallen, we picked our chins up from the dusty volcanic floor and began climbing again. Reaching the highest point of our trek, we were blown away by the 360 degree vista on offer. We’ve had some pretty incredible experiences so far on our travels, and this point rivalled some of the very best moments. It’s not often we recommend a must see or do, but this was a moment that made the preceding hours, and the pain, worthwhile. 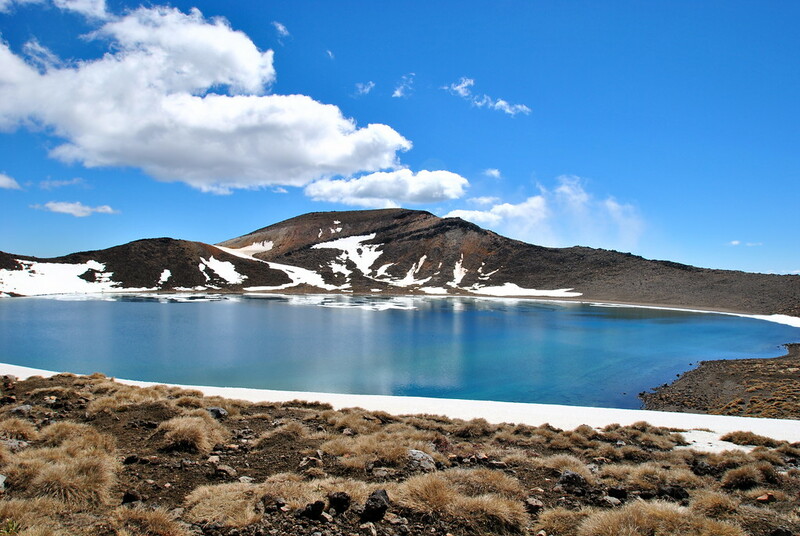 Directly in front of us was an incredible blue lake, surrounded by snow capped mountains. Just below it to our right were three luminous green lakes, glistening emerald colour. To our right just behind us was a gigantic smouldering red crater, steam and gases rising out of it. Everywhere we looked there was something incredible to see. After sitting at the top admiring all that we could see, it was time to make the first of many descents. First up, the emerald lakes we could see way down below us. This was where the track became a loose load of ash/output from volcano, and we slowly scrambled down the slope as the ground gave way under us. After 20 minutes or so, we reached the emerald lakes, and stopped for a few minutes before the strong smell of sulphur (think rotten eggs) overpowered us. 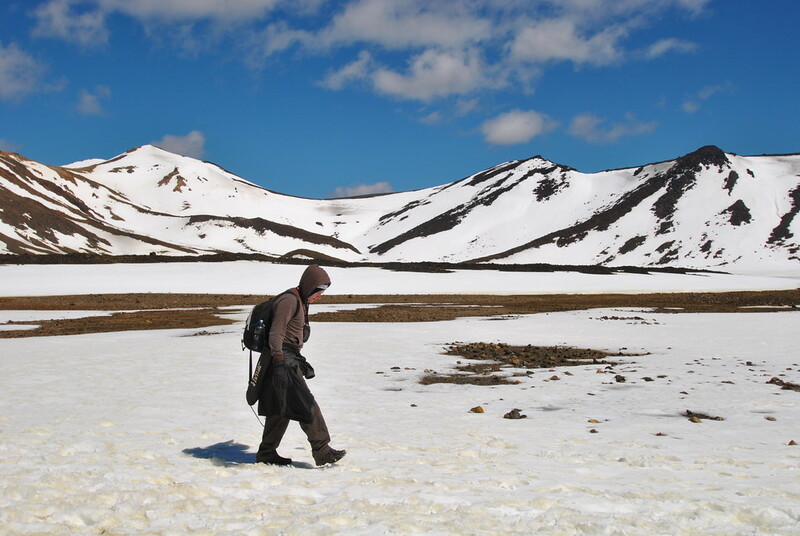 We quickly made our way past the lakes and onto the large, white expanse of snow we had to cross before we could descend further. After crossing the great sheet of snow, we were on the move upwards again towards the great blue lake where we stopped for some food and drink. And then the final descent, a three hour climb down the valley, zig zagging left and then right, and back left. This was not the most exciting part of the journey until we reached this sign: Things just got exciting. 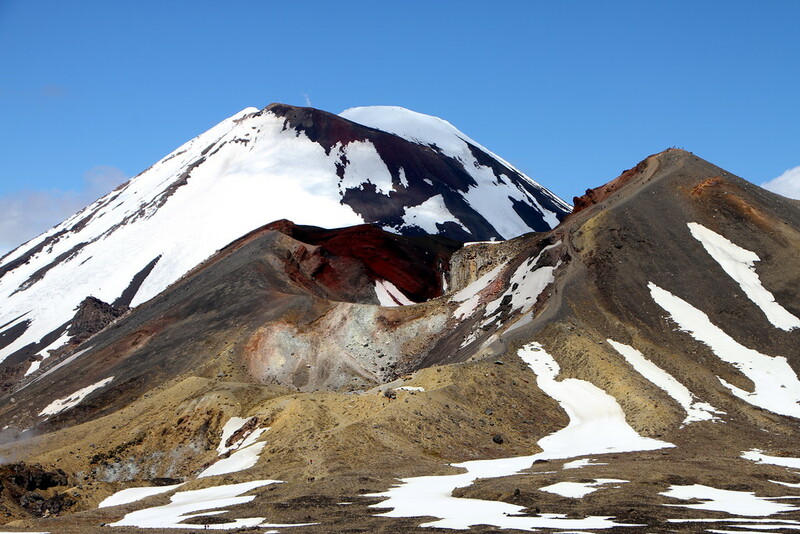 Mount Tongariro erupted only 12 weeks previously, scattering debris all over the surrounding areas. 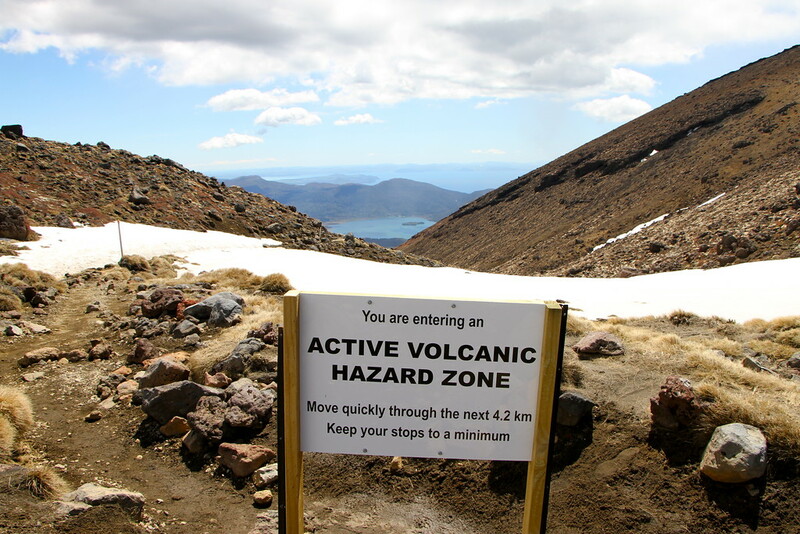 When we first saw the sign we didn’t think much of it, we knew we were in a volcanic region. But it was when we turned the corner of the valley and the (seemingly active) volcano came into view, pumping out gases and steam all around it from various vents. We picked up the pace. As we turned the valley corner, all of the craters from the recent eruption were plain to see. We were right in the firing line, and made easy work of the final 8km down the hill to the end of the trek, 8 hours after we’d set off before sunrise. 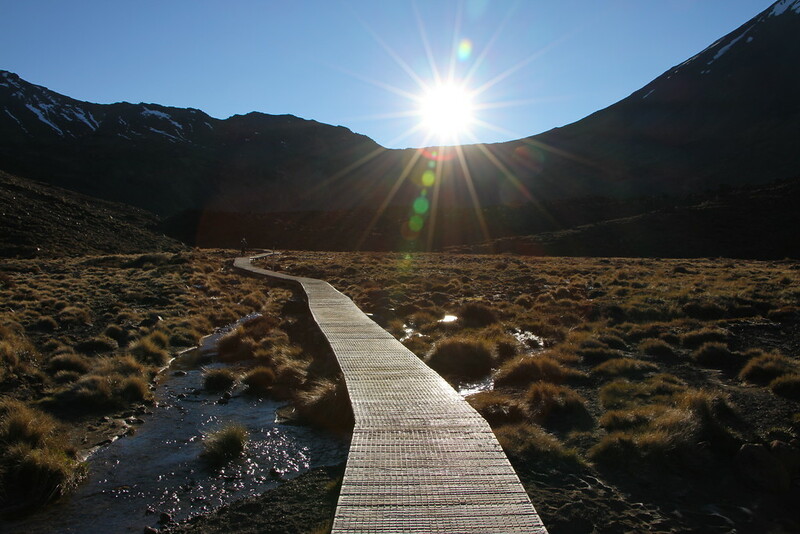 The Tongariro Crossing was the highlight of our time in New Zealand. We were lucky with the weather, and crossing it at the beginning of November when there was still snow on the peaks but not on the path was perfect, but overall the crossing is an incredible experience. We stopped for lots of photos so it took us 8 hours to complete, and as complete amateurs we found it hard but achievable. Just make sure you layer up and take a hat and gloves as it gets below zero at the peak even in Spring when we climbed it. As usual in New Zealand, we celebrated our achievement with a chilled bottle of Marlborough Sauvignon Blanc and a dip in a hot mineral pool to ease our shocked muscles. Well, it would be rude not too. Can’t wait to visit the Kiwi’s ! Great pictures, great website… Enjoy ! What absolutely amazing photos – I can see why it’s a”must see” trip, but sounded tough going – just as well there was a lovely chilled bottle of Marlborough Sauvignon Blanc at the end of it all!! What an achievement – but also can’t get over Barry eating that horrendous Grub – it loooked absolutely disgusting – amazing he didn’t spit it out! Great post guys! You got seriously lucky with the weather, we were there a few days later and it was touch and go if we could do it but the snow held off luckily! Ah cool guys, didn’t realise we were so close to eachother! We’d heard the day before was terrible weather so glad it held out for you as well! Some of the best photos yet of your trip so far. Thoroughly enjoyed reading this blog…well done you guys ! Thanks Liz, glad you enjoyed it!